All of Cecil Con’s posters and t-shirts have been carefully designed and illustrated by talented former students and staff at Cecil College, as well as local artists and so we want to keep showing them off for years to come! Take a look through the below gallery and contact the Cecil Con staff if you’d like any additional information about the artists or convention. If you’re interested in designing a poster or t-shirt for Cecil Con then contact us to let us know. 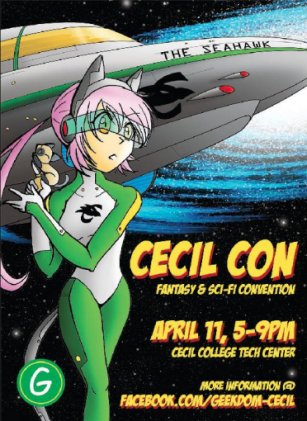 This design is the official poster for Cecil Con 2018. 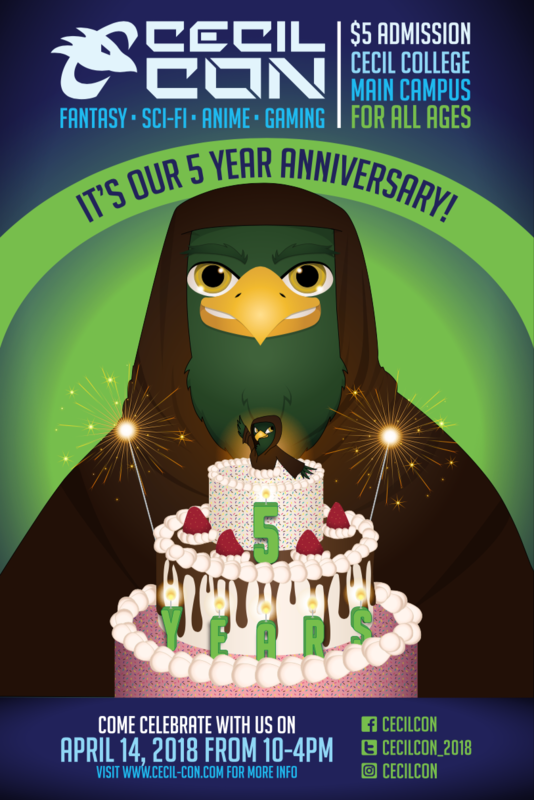 We are celebrating our 5 Year Anniversary and this design features our very own Cecil Seahawk mascot holding a giant cake decorated with candles and a miniature candle version of himself. Sheila used lighting to created a focal point in the artwork and pull in the attention of viewers. This design appeared on postcards, the website, and social media pages. Designed by artist Amber Davis. 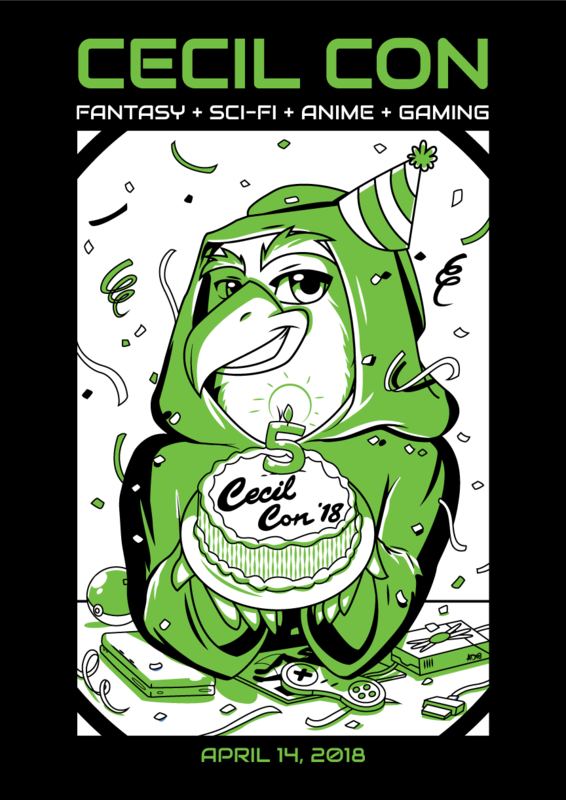 This was the official t-shirt design of Cecil Con 2018. The design features the Cecil seahawk helping us celebrate our 5 year anniversary. You can see that he is surrounded by his favorite things in the sci-fi, fantasy, anime, and gaming realms, such as Pocky, Poké balls, and gaming consoles. Amber designed this for us in less than 12 hours showing her skill and expertise, wow! Designed by former Cecil College student Maddy Rose Finnan, and alumna Meredith S. K. Boas. This design is the official poster for Cecil Con 2017. The design is inspired by the fantasy aspect of Cecil Con. We usually go for a sci-fi look, but we felt that this year we needed to represent our medieval roots with a Renaissance look. This design will be used in many aspects of the 2017 convention branding, such as the convention booklet, postcards, website, social media, maps and more. This poster was drawn by Maddy Rose Finnan, but vectorized and colored by her sister Meredith S. K. Boas. 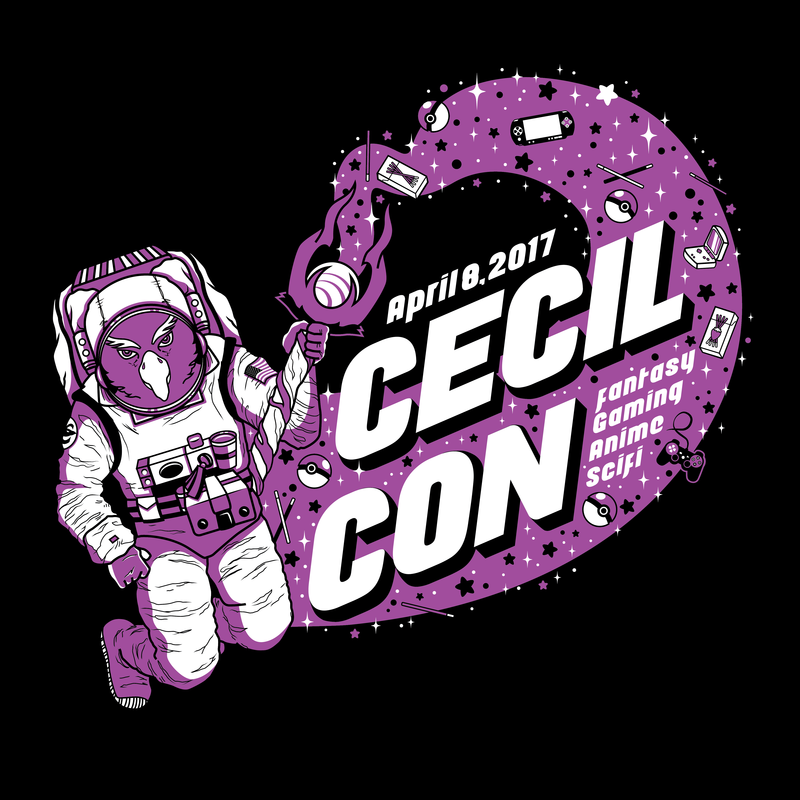 This is the official t-shirt design of Cecil Con 2017. The design features the Cecil Seahawk in outer space as an astronaut wielding magic? We combined concepts of fantasy and sci-fi to create a unique piece that’s fun without taking itself too seriously. The Seahawk was hand drawn by Maddy Rose Finnan and vectorized and laid out by Meredith S. K. Boas (Maddy’s sister). These shirts were screen-printed with two ink colors and they GLOWED IN THE DARK. Designed by former Cecil College VCP student Jade Wampler. These designs were the official posters for Cecil Con 2016. 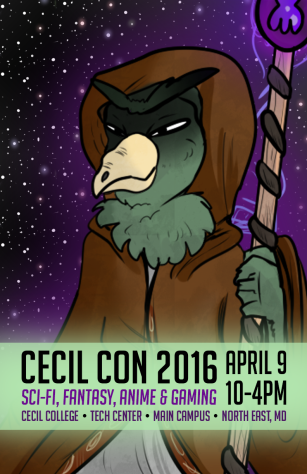 The first poster feature’s the Cecil Con Seahawk in his full wizard/jedi robes, holding his magical staff and posing regally. He’s featured on a classic galaxy background for a timeless sci-fi look. 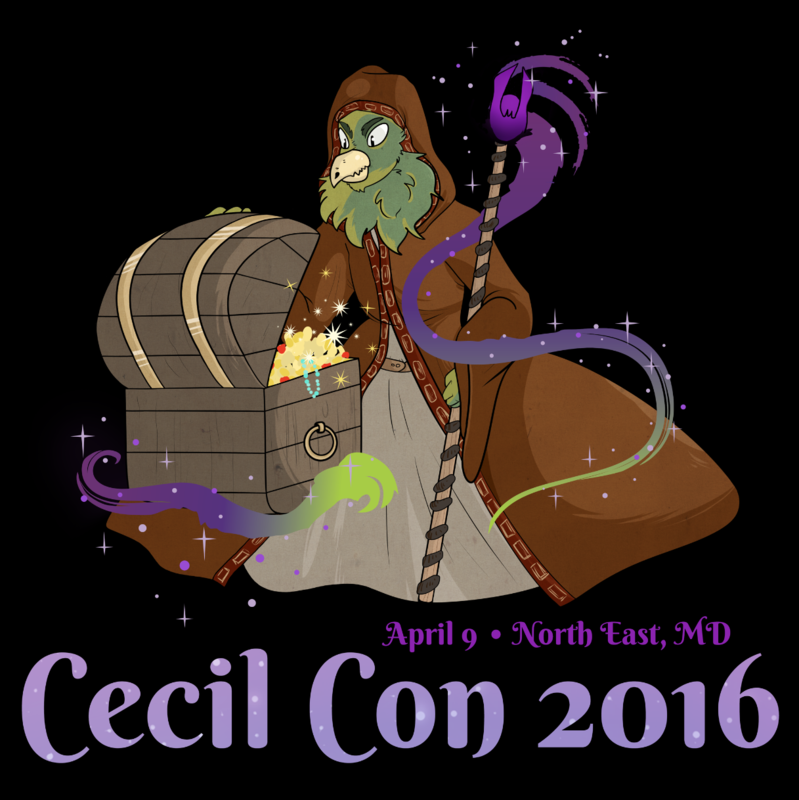 This design served as the official Cecil Con 2016 t-shirt. Originally supposed to be screen-printed, this shirt was ultimately heat-pressed because it was designed in Photoshop, and was not vector-based. This was the first year we offered t-shirt merchandise to attendees. The design features our Cecil seahawk in his wizarding robes as he uses his magical staff to levitate a treasure chest of precious gems and coins. 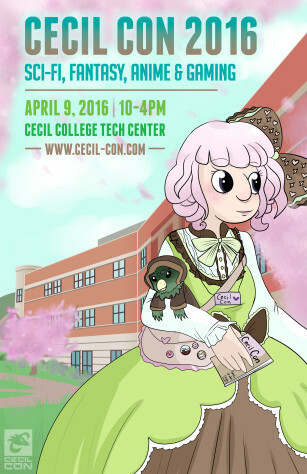 This design was the official poster for Cecil Con 2015. 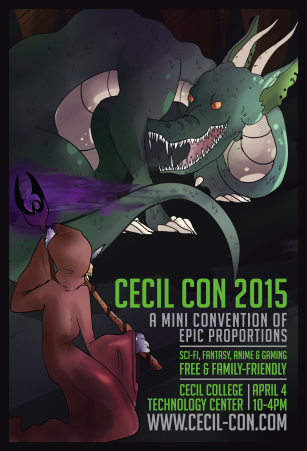 This poster feature’s the Cecil Con Seahawk with his back turned to us as he tames a large dragon. 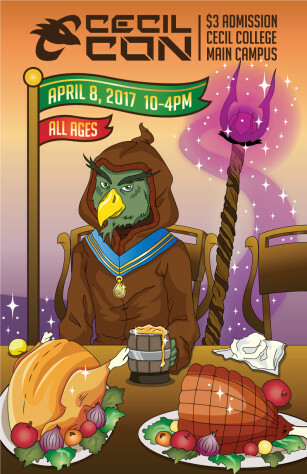 This poster was inspired by the Con’s mascot, and the past convention poster design by Neal Autman. This design was used in many aspects of the 2015 convention branding, such as the convention booklet and postcards. Designed by former Cecil College student Amy Deck. 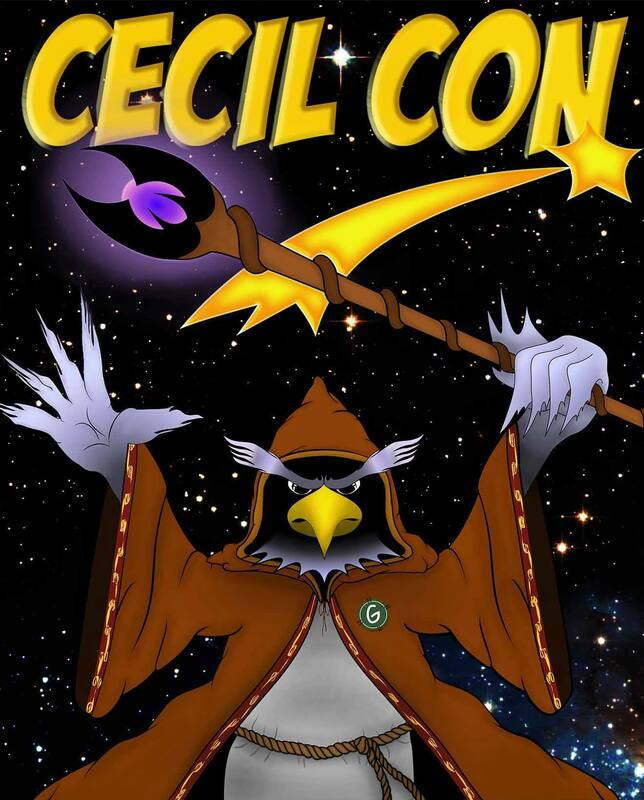 This design was the official poster for Cecil Con 2014. This poster feature’s a fictitious science-fiction character designed specifically for Cecil Con. 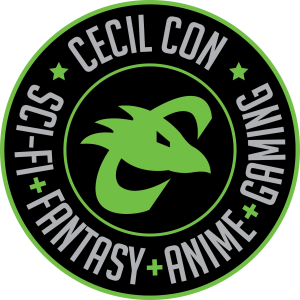 The emblem on the character’s uniform served as the inspiration for Cecil Con’s current official logo because it’s that awesome! Designed by former Cecil College VCP student Neal Autman. 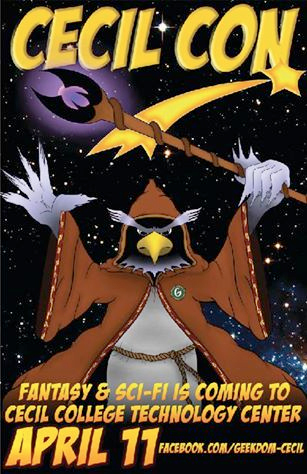 The poster features Geekdom’s Cecil Seahawk dressed in his mystical robes and holding his sorcerer’s staff. If you missed out on getting your copy of this print, then please let us know!